Ghukato uses every opportunity to tell his non-Adventist classmates about his hope in Jesus’ Second Coming. Adventist education is an important part of evangelism in Southern Asia Division. Since the church’s beginning, schools have been soul-winning entities. With a high standard of education in English rather than local languages and a prominent religious factor, hundreds of students in Adventist schools give their lives to Christ and are baptized every year. This religious emphasis spills over to families as well. A large percentage of students in Adventist schools are not from Adventist homes. Children take home what they’ve learned at school, and entire families often choose to become Christ’s followers. Nagaland Seventh-day Adventist School in northeastern India is a K-12 day school with 204 students. It has been approved to expand into a boarding school, but it needs dormitories. This quarter’s Thirteenth Sabbath Offering will help build a girl’s dormitory while the school raises funds for a boy’s dormitory so that students from a wider area can receive the advantages of an Adventist education. 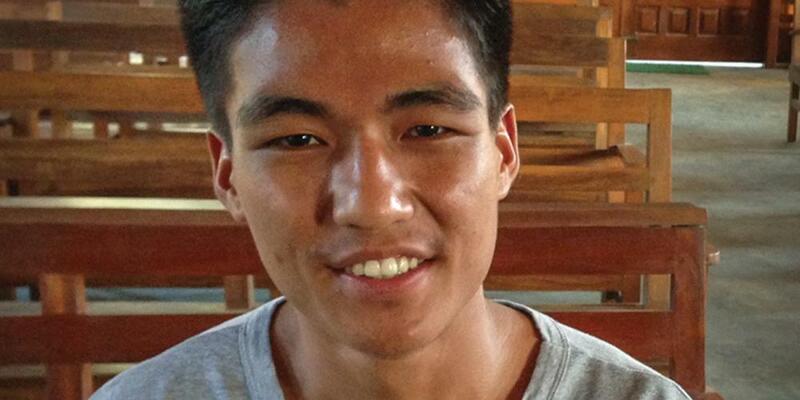 Sixteen-year-old Ghukato [pronounced: goo-KAH-toh], a student in northeast India, wants to become an evangelist one day. But he isn’t waiting to finish school to share Jesus’ love with others. Ghukato uses every opportunity to tell his non-Adventist classmates about his hope in Jesus’ Second Coming. He offers to study the Bible with them if they’re interested. Ghukato says he hasn’t been able to stop talking about Jesus since he was baptized when he was 13. “I want to become an evangelist,” he says with an eager smile. Ghukato’s parents joined the Seventh-day Adventist Church after attending evangelistic meetings when Ghukato was 9. Both he and his brother, who is two years younger, study at Nagaland Adventist School, a K-12 day school in a remote corner of northeastern India. The school has 204 students, many of whom come from Christian families who are not Adventist. Ghukato likes the spiritual activities on campus. He especially likes the first class every morning when students sing, pray, and read the Bible together. Ghukato’s teachers are impressed when they see the boy helping other students with their homework and sharing his faith with them whenever the opportunity arises. Ghukato has found that it isn’t always easy to share his faith. The parents of some of his classmates don’t want their children attending the campus church on Saturday. But Ghukato keeps inviting them to church anyway. The open invitation has brought several friends to church, including one who asked to be baptized. Another friend got into trouble for visiting the church. When his parents found out, they refused to allow him to go again. Refusals don’t discourage Ghukato. He just finds others with whom he can be friends, sometimes away from the school campus. At a local supermarket, he befriended a worker named Albert. He and Albert have talked about Adventists and the Sabbath. Albert has said he is too busy for church, but he happily accepts the Adventist World magazine and other religious literature that Ghukato offers him. Ghukato’s love for God started at home, and Ghukato continues to make home a priority. When his mother became ill and was unable to clean the church on the school’s campus, he urged her to stay in bed until she was well. When she again tried to get up and go to the church to clean, Ghukato hid the church key until he was able to go in her place. He quietly cleaned the church for her until she was able to do it again. Asked about the school’s greatest need, Ghukato immediately declared that students need their own dormitories, and that’s true. At this point the school is a day school. But if it had dormitories, many more students could come to study there. The Thirteenth Sabbath Offering will help the school build a dormitory for girls. But the school plans to raise enough money to build a boys’ dormitory as well. Ghukato says both dormitories are important because many children who would like to study at the school cannot make the daily commute. Please remember the Nagaland Seventh-day Adventist School in your prayers and give generously to the Thirteenth Sabbath Offering.